We truly live in the best age for food. 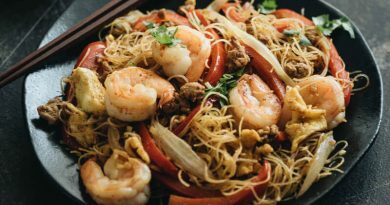 Never before has the spreading of culinary knowledge and innovation experienced the speed we have today. But sometimes, we have to take a step back from Poutine Pizzas, Ramen Burgers, Fried Ice Creams and go back to hard times. Like a toast, but toastier. Meaning a toast in between two slices of untoasted toast. 1877. 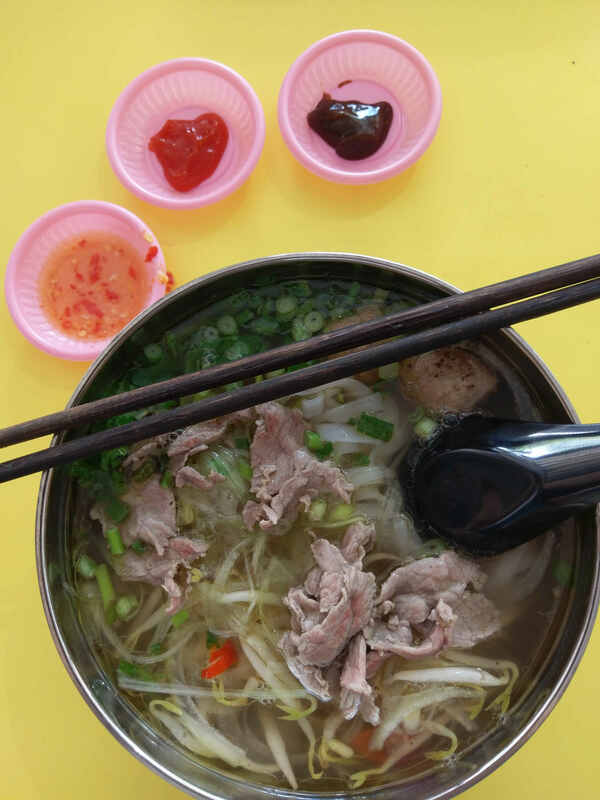 INGREDIENTS.—Thin cold toast, thin slices of bread-and-butter, pepper and salt to taste. Of course it had to be the British. It also sounds like a meal made by someone who only toasted one slice of bread, then decided that toasting the remaining two is probably too much work. Is Toast Sandwich a Sandwich? On 15 November 2011 the Royal Society of Chemistry, an organization in the United Kingdom, recreated the “neglected mid-Victorian sandwich to help the country through hard times”, much needed in a time of the Great Depression. The RSC was so confident that this was the cheapest meal possible at 7.5p, that they decided to offer “£200 to the first person who can prove them wrong by devising a more economical – but edible – lunchtime meal.” This later turned out to be quite a terrible idea since they were overwhelmed with responses and had to randomly give an entrant. But I guess the publicity worked, since it managed to get The Fat Duck, a three Michelin Starred restaurant to include it in a menu. It turned out that the recipe was made for “invalids”, which meant sick people at that time. Suddenly, this makes a lot more sense. This wasn’t meant to be a gourmet everyday meal. But browsing further leads me to an even sadder recipe. 1876. INGREDIENTS.—A slice of bread, 1 quart of boiling water. Mode.—Cut a slice from a stale loaf (a piece of hard crust is better than anything else for the purpose), toast it of a nice brown on every side, but do not allow it to burn or blacken. Put it into a jug, pour the boiling water over it, cover it closely, and let it remain until cold. When strained, it will be ready for use. Toast-and-water should always be made a short time before it is required, to enable it to get cold: if drunk in a tepid or lukewarm state, it is an exceedingly disagreeable beverage. If, as is sometimes the case, this drink is wanted in a hurry, put the toasted bread into a jug, and only just cover it with the boiling water; when this is cool, cold water may be added in the proportion required,—the toast-and-water strained; it will then be ready for use, and is more expeditiously prepared than by the above method. 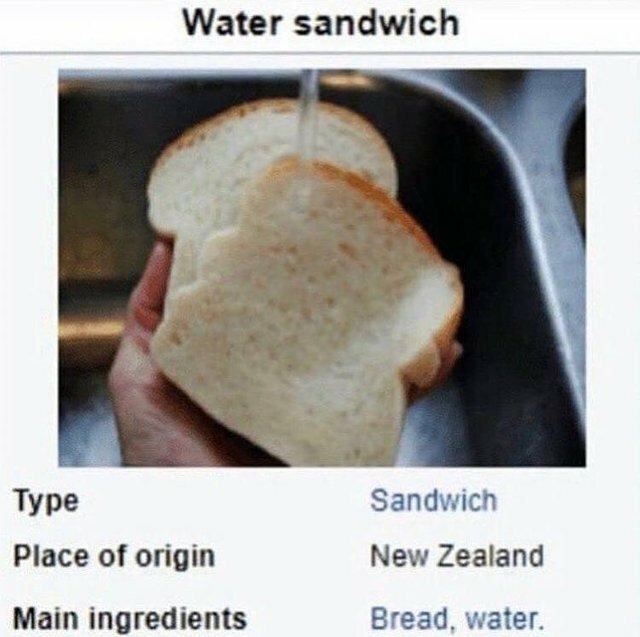 As it turns out, the Water Sandwich meme was real. SheKnows recreated the toasted sandwich and surprisingly liked it. In my quest to explore philosophical topics on food, I decided to uncover what does it truly mean to be a sandwich. For that, I first turn to existing definitions. As it turns out, in Massachusetts, it was ruled before in a legal case that a burrito is not a sandwich. A sandwich shop had signed a lease with the condition that they were the only shop allowed to sell sandwiches. They weren’t quite happy with the Mexican grill selling tacos, burritos and quesadillas. But it isn’t quite useful to turn to legal definitions. The New York Department of Taxation and Finance lists Burritos as a sandwich. And then according to the Food Standards and Labeling Policy Book by the U.S Department of Agriculture (USDA), closed sandwiches “must contain at least 35 percent cooked meat and no more than 50 percent bread.” Clearly, existing definitions leave much to be desired since any vegetarian sandwiches are not considered sandwiches. 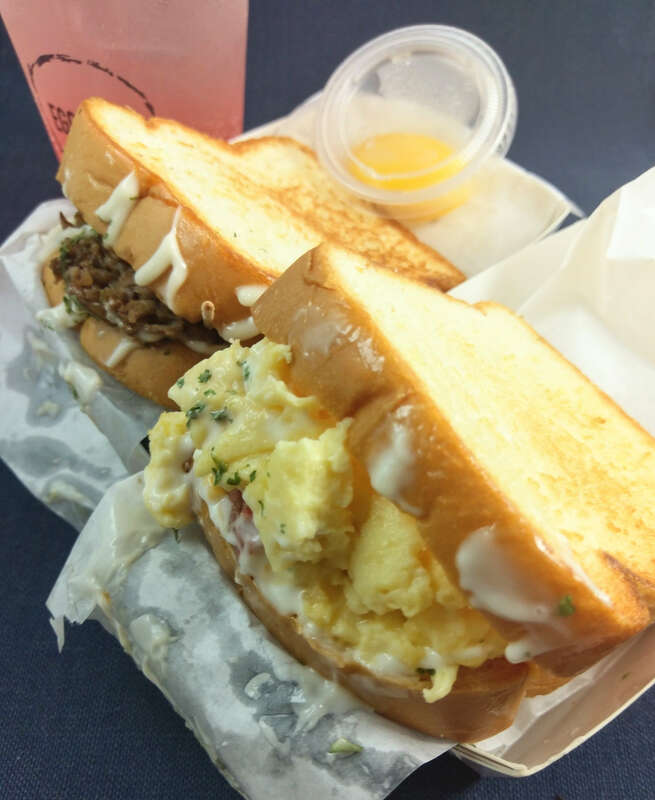 To make things even more complicated, in the U.S., the Food and Drug Administration regulates closed sandwiches while the USDA regulates open faced sandwiches. I almost want to say that this is where the fat boi should step in and clearly define what makes a sandwich, but as a non-sandwich expert I feel unqualified to do so. 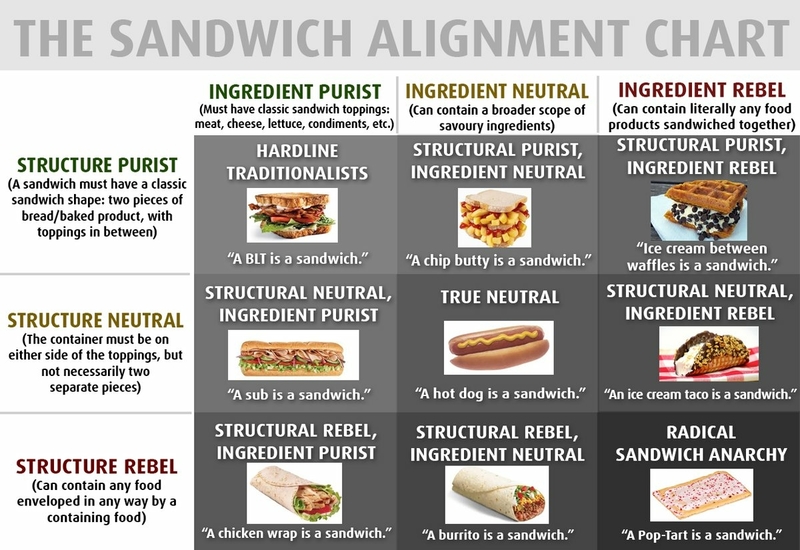 Therefore, consult the sandwich alignment chart and this reddit thread for it is the best sources for sandwich definition thus far. Though, for constructive purposes towards building a globally accepted definition of sandwiches, I propose that “open-faced sandwiches” be called “tartines” to prevent further confusion. Colette Shade’s Is a Toast Sandwich Really a Sandwich? Thanks to this sub, I discovered the toast sandwich. I now have one for breakfast every day.